I was very inspired by UrbanOutfitters Spring 2011 catalog. It has a late 60s-70s feeling, but with some reference back to the 40s, such as the harem style pants in chiffon and silk. I always fall in love with different prints and usually look for more abstract ones, but the lines can be blurred with some ethnic prints, new or vintage. and the headscarf is very 70s, but knotted at the top of the head or worn in a turban style is a 1940s trend. I really like the tribal ethnic look of these outfits. These styles inspired me to make some purchases for my own spring wardrobe, although from a variety of sources. These gorgeous silk tribal print top from Forever 21. Its sheer so it will need a camisole underneath, but just as gorgeous in person. Also, these woven pants in olive from Forever 21. They are sort of silky, light weight and have a side zip. There are a few other harem type pants on the site, but I like these the best because there is no elastic at the ankles (great for shorter girls who might have to cuff). Also from Forever 21, these faux suede shoes with stacked heels. I need some neutral color shoes (other than black) that also have a moderate, comfortable heel. I purchased the taupe which was darker in person and more of a mushroom color. But for $20 you can't go wrong. I may wear these with this look, but am also on the hunt for the perfect sandals. 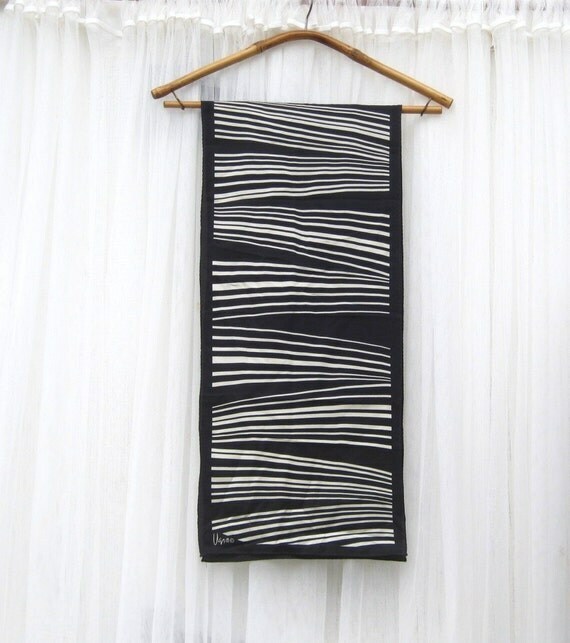 And to perfect the look, I found this great Vera scarf on Etsy by sixcatsfunVINTAGE. All I need is a great pair of sunglasses!